As I was brainstorming about what to include in the curriculum of our leadership programme for rural women, I went through a number of training modules developed by various NGOs and UN funded projects. I found mostly conventional training outlines and techniques, similar analogies and icebreakers, a few slogans and posters. I was keen to do something different. Simple activities that were easy to do at scale, but had the potential to make a huge impact (think Gandhi’s salt march, or emphasis on spinning Khadi…). With no ‘eureka!’ moment, and the need to start the programme at the earliest, we launched it with a simple ‘needs identification’ baithak (meeting) in each of the 1700 Gram Panchayats (GP) that were part of the programme. Women part of Self Help Groups were asked to identify key problems or needs of their village, and then collectively prioritize the biggest and most important problems and needs from the list. The list of problems were similar across all the GPs- NREGA, ration, water, electricity, housing, sanitation, cleanliness, pension, road, drainage, health services…. Either schemes pertaining to these needs did not reach their village, or they were given to Upper Caste or reasonably well-off members of the village, mostly those close to the Pradhan. They then introspected on why these problems exist, and why their needs remained unfulfilled, even after all these years! The buck stopped with the Pradhan. Everyone agreed that all their needs fell under the Panchayat’s roles and responsibilities, but why then were they not fulfilled? How long can one keep blaming others? Don’t we as citizens also have responsibilities? Political leaders come and go (if at all), visitors come once in a while. But they live in their village. They face these problems. So just like their ‘Self Help’ groups, until they decide to help themselves, nothing will change! With this realization, it was decided that women interested in changing the status quo and doing something about their problems would try to mobilize and convince their friends and peers to collectively try and seek solutions to their needs and problems. A few weeks back, a colleague told me that in a village in Eastern UP, a few women collectively went and spoke to the Block Development Officer about the lack of cleanliness in their village. That very evening, an officer came for inspection, and sent Safai Karamcharis (cleaners) to clean up the place the very next day! Following this, they requested the construction of toilets in their village, and immediately the construction of 22 toilets got approved! All they had to do was come together and ask. 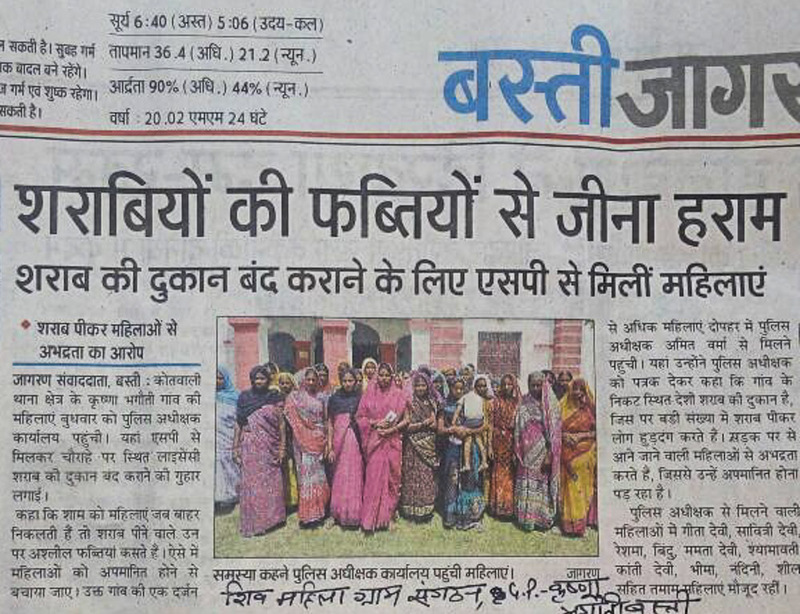 Today, I received two newspaper reports highlighting efforts by women in two other blocks of Eastern UP. In one place, 14 women went to meet the District Magistrate to ask why their village hadn’t received a single one of the 29 government schemes they were entitled to. The DM promised to visit their block and GP within the next 4 days! 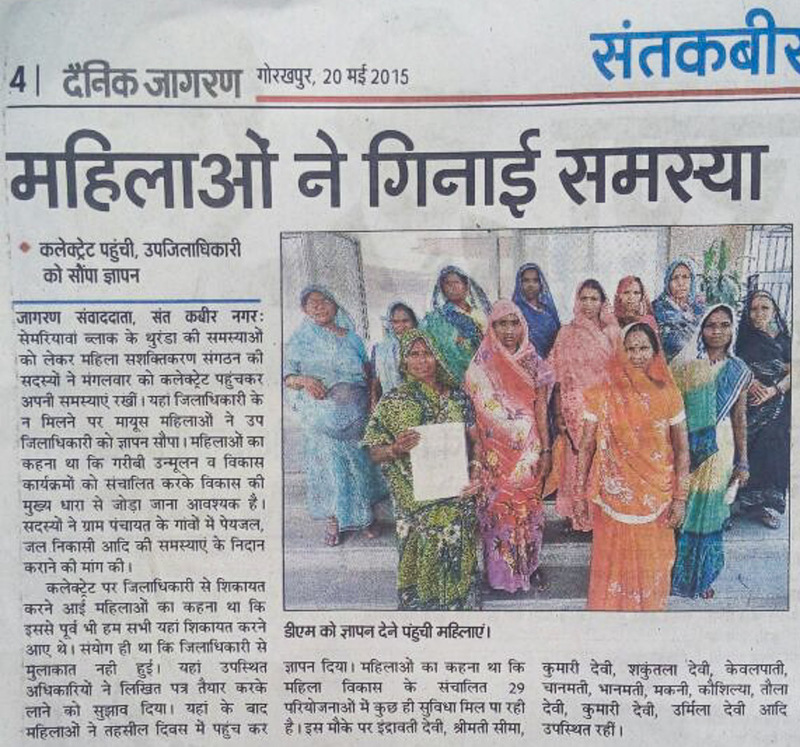 At another place, 50 women met the Superintendent of Police as well as the District Magistrate to request the shutting down of a liquor shop in their village that made it unsafe for them to go anywhere near it in the evenings. The officials took action immediately and shut down the shop, leaving the owners trying to resort to bribery and other means to try and have it reopened! There are numerous cases like this that reiterate the power of collective action. The efforts of these women only prove that this is possible even in a deeply patriarchal, corrupt, casteist and feudalistic set up! In chaos theory, there’s something known as the ‘butterfly effect’ – which refers to ‘the sensitive dependence on initial conditions in which a small change in one state of a deterministic nonlinear system can result in large differences in a later state’. My experience working with these women over the last few months reminds me of this theory. Who would have thought a simple discussion on the needs and problems of one’s village could be resolved by merely a collective initiative by these women to proactively engage? And who would have thought, like in all three cases, merely speaking with the respective officials could solve the matter? There was no use of violence, no threats, no abuses – just a peaceful, earnest conversation! These cases may seem insignificant in the larger context of UP, but at the same time, they are also extremely significant for the change that actions like these have the potential to initiate! 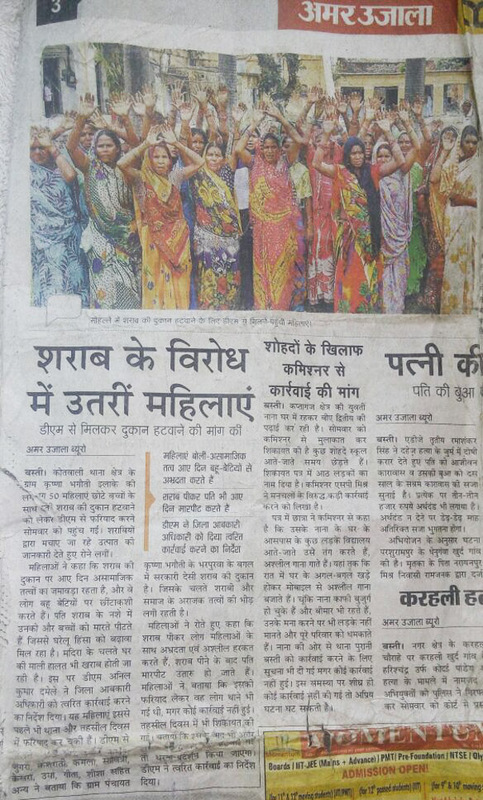 If conversations around needs and problems of rural India are happening simultaneously in 1700 GPs of UP, followed by even one instance of collective action to tackle one of the needs or problems identified by them, that’s 1700 groups of women in one of the poorest, most patriarchal and backward states of India, voicing their concerns and needs (possibly for the first time), and taking the first step towards accessing their rightful schemes and entitlements! If there’s one thing I’ve learned from the organization I currently work with, it’s to believe in the innate ability of rural women in India to be their own change-makers. They need nothing more than a little bit of information and perhaps a word of encouragement. We spend weeks and months in cities to plan public meetings, conferences and protest marches. We spend money and use technology to mobilize people for a cause. All it took for these women to come together and initiate change in their respective villages and communities- however small for now- was just an idea in their head that maybe they could do it! Many women I have spoken to who have engaged in collective action like these, view it as an opportunity to step out of their homes and try something new. If it doesn’t work, they have nothing to lose, given that most of them are unable to access their rightful schemes and entitlements anyway! But if they succeed, they inspire a lot of other women who are watching them with curiosity and hope! In the coming months we are hopeful that through our leadership programme, many more women will be inspired to actively participate in local governance – by attending and raising issues at public meetings, engaging with public officials, discussing collective problems and development of their village, and perhaps even participating in the upcoming Panchayat elections – not just as voters but even candidates. As a recent ToI report stated, about 11 crore voters will decide the winners to over 8 lakh posts in the upcoming UP Panchayat elections! The three-tier Panchayat elections will be held for 59,164 posts of Pradhans (village chief), 7,43,297 posts of Gram Panchayat (ward) members, 77,925 posts of Kshetra (block) Panchayat members, and 3,128 posts of Zila (district) Panchayat members! That’s a pretty HUGE election we are talking about – and according to the report, the largest local body election in the world! However, for India to be in the forefront of effective local governance, women’s participation is necessary. And for women to effectively participate, their voice needs to be heard not just in public meetings as citizens, but also in crucial decision-making processes, for which it is necessary that we also have enough elected women representatives!